BATON ROUGE, La. 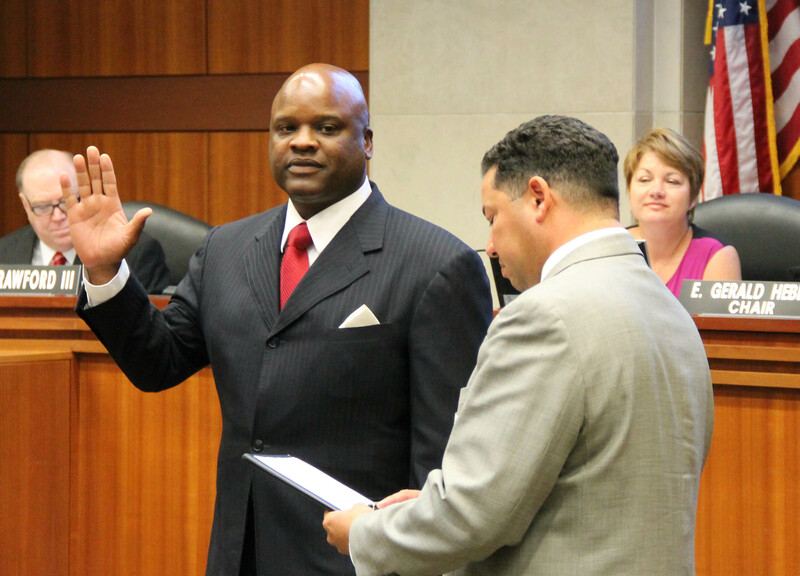 – New Orleans attorney James Carter was sworn in as the newest member of the Board of Supervisors for the University of Louisiana System. “I’m honored to be part of such an august board and such an important mission for the state of Louisiana,” Carter said. Board Chair E. Gerald “T-Boy” Hebert appointed him to the Board’s Athletics, Finance and Facilities Planning Committees. Carter, who opened his law firm in 2000, is a native New Orleanian and an accomplished civil trial attorney. He is a former member of the New Orleans City Council. Carter earned his Bachelor of Arts and Juris Doctorate from Howard University. He has served on the boards of Ochsner Baptist Hospital, Second Harvest Food Bank, New Orleans Police and Justice Foundation and Louisiana Endowment for the Humanities. His wife, Rene Lewis Carter, principal of Martin Behrman Charter School of Arts and Sciences in Algiers, was recently named Louisiana 2016 Middle School Principal of the Year. They have one son, Brice. Among the programs approved by the UL System Board of Supervisors were a number of existing degree and certificate programs that now will be available online. The Board approved an online Master’s Degree Program in Educational Leadership from University of Louisiana at Lafayette and an online Bachelor’s of Social Work degree program, offered through Northwestern State University. It also approved six existing Graduate Certificate programs and four existing Master’s Degree programs at Louisiana Tech University available through distance learning technologies. All of the programs are scheduled to begin this fall. “These are existing programs that are in high demand, particularly for individuals with full-time jobs who are interested in extending their education or gaining professional development. Nontraditional students need flexibility, and our campuses are responding,” said UL System Executive Vice President and Provost Karla Hughes. LA Tech: approval to revise the alignment of the Computer Infomraiton Systems Group from the School of Accountancy and Information Systems to a separate entity, the Computer Information Systems Department, in the College of Business. LA Tech: approval to offer ten existing academic programs via distance learning technologies. McNeese: approval to terminate the Graduate Certificate in Counseling K-12. Northwestern: approval to offer online an existing academic program: Bachelor of Social Work effective Fall 2015. Northwestern: approval of a Proposal for a Post Associate Certificate in Quality Control. Northwestern: approval of a Proposal for a Post Baccalaureate Certificate (PBC) in Quality Control. Northwestern: approval of a Proposal for a Post Associate Certificate in Project Management. Northwestern: approval of a Proposal for a Post Baccalaureate Certificate (PBC) in Project Management. Northwestern: approval of a Proposal for a Post Baccalaureate Certificate (PBC) in Business Analytics. Northwestern: approval of a Proposal for a Post Graduate Certificate in Family Nurse Practitioner. Northwestern: approval of a Letter of Intent to offer an Associate of Applied Science Degree in Engineering Technology. Northwestern: approval of a Letter of Intent to offer a Doctor of Education in Adult Learning and Leadership degree program. UL Lafayette: approval to offer an existing program online: the Master’s Degree Program in Educational Leadership. UL Lafayette: approval of a Letter of Intent to offer a Master of Science degree program in Environmental Resource Science. ULM: approval of a First Amendment to the Memorandum of Understanding between the University of Louisiana at Monroe and the National University Corporation Ehime University in Japan. ULM: approval of Cooperative Agreements with three international universities in the Republic of Korea. UNO: approval of the Joseph Canizaro and James Livingston Center for Environmental Informatics. UL System: approval of System Universities’ 2015-16 Promotions in Faculty Rank and Recommendations for Tenure. LA Tech: approval of a contract with Mr. Eric Konkol, Head Men’s Basketball Coach, effective May 18, 2015. Northwestern: approval of a contract with Mr. Sean Kiracofe, Head Women’s Volleyball Coach, effective April 13, 2015. Northwestern: approval of a contract with Mr. Donald Pickett, Head Softball Coach, effective July 1, 2015. Northwestern: approval of a contract with Ms. Brooke Stoehr, Co-Head Women’s Basketball Coach, effective May 1, 2015. Northwestern: approval of a contract with Mr. Scott Stoehr, Co-Head Women’s Basketball Coach, effective May 1, 2015. Southeastern Louisiana University’s approval of a contract with Mr. James Riser, Head Men’s Baseball Coach, effective July 1, 2015. UL Lafayette: approval of the second contractual amendment with Mr. Mark Hudspeth, Head Football Coach, effective July 29, 2015. UL Lafayette: approval of a contractual amendment with Mr. Jay Johnson, Assistant Football Coach/Offensive Coordinator, effective July 23, 2015. UL Lafayette: approval of a contract with Mr. Robert Marlin, Head Men’s Basketball Coach, effective April 1, 2015. UL Lafayette: approval of a contract with Mr. Mitch Rodrigue, Assistant Football Coach/Offensive Line, effective June 1, 2015. ULM: approval of a contract with Mr. Ryan Cross, Assistant Basketball Coach, effective September 1, 2015. ULM: approval of a contract with Mr. Keith Richard, Head Men’s Basketball Coach, effective September 1, 2015. UNO: approval of a contract with Mr. Michael Blake Dean, Head Men’s Baseball Coach, effective August 1, 2015. UNO: approval of contractual amendments with Mr. Derek Morel, Athletic Director, effective July 1, 2015. UNO: approval of a contractual amendment with Mr. Mark Slessinger, Head Men’s Basketball Coach, effective July 1, 2015. Grambling: approval to demolish the C.D. Henry Natatorium as part of the Intramural Center Renovation and Expansion Project. McNeese: approval to enter into a facilities lease agreement with ELS Educational Services, Inc. for ELS to provide English as a Second Language program to international students. UL Lafayette: approval to demolish the Cox Communications Athletic Center as part of the Athletic Master Plan. ULM: approval of a Proposal for Lease of Space for the operation of the University Bookstore. UNO: approval to sell the UNO: TAC Building located on UNO’s East Campus at 6601 Franklin Avenue in New Orleans, Louisiana. UL System: approval of the Fiscal Year 2016-17 Capital Outlay Budget Request and Institutions’ Five-Year Capital Outlay Plans. Grambling: approval to declare financial exigency for the Bachelor of Science in Nursing degree program. LA Tech: approval of a Cooperative Endeavor Agreement with PSF International, LLC. McNeese: approval to place a referendum for a student self-assessed fee on the Fall 2015 ballot. Northwestern: approval to enter into a Cooperative Endeavor Agreement with Natchitoches Parish Hospital Service District No. 1, DBA Natchitoches Regional Medical Center, Parish of Natchitoches, State of Louisiana, to provide athletic training services. Northwestern: approval to enter into a Cooperative Endeavor Agreement with Natchitoches Parish Hospital Service District No. 1, DBA Natchitoches Regional Medical Center, Parish of Natchitoches, State of Louisiana, to provide a continuum of care for the treatment of episodic injuries sustained in sports, and administrative services such as billing, third party administrator services, and claims adjudication for student-athletes. ULM: approval to redirect the current Kitty DeGree Eminent Scholars Chair in Toxicology to the Kitty DeGree Eminent Scholars Chair in Nursing. UNO: approval to split the Avondale Industries Chair in Shipbuilding Engineering Management and The Avondale Industries Chair in Engineering and Shipbuilding into six Super Endowed Professorships. UNO: approval to enter into a Cooperative Endeavor Agreement with Navitas, Limited. UL System: acceptance of Fiscal Year 2014-15 Financial and Compliance and Federal Award Programs Representation Letters for: (a) Grambling State University, (b) Louisiana Tech University, (c) Northwestern State University, (d) Southeastern Louisiana University, (e) University of New Orleans, and (f) University of Louisiana System. UL System: approval of Fiscal Year 2015-16 Operating Budgets, including organizational charts, undergraduate/graduate mandatory attendance fees, scholarships, and System Shared Costs. UL System: approval of autonomies granted in House Bill 766, Act 359, of the 2015 Regular Session of the Louisiana Legislature. Grambling: approval to appoint Mr. Otto O. Meyers as Interim Vice President for Research, Advancement, and Economic Development effective August 1, 2015. Grambling: approval to appoint Dr. David C. Ponton, Jr. as Interim Vice President for Student Affairs effective August 10, 2015. Grambling: approval to appoint Dr. Erick Valentine as Interim Dean of the College of Business effective August 1, 2015. Nicholls: approval to appoint Dr. Lynn Gillette as Provost and Vice President for Academic Affairs effective July 1, 2015. UL Lafayette: approval to continue the appointment of Dr. Nathan Roberts as Interim Dean of the College of Education effective July 1, 2015.